Płk Ryszard Kukliński - o Jaruzelskim "Wolskim"
" wszcząłem procedurę emigracyjną( ) "
The Wall Street Journal cataloged and mapped some of the debris of Malaysia Airlines Flight 17, which fell across three Ukrainian villages after the Boeing 777 was brought down on July 17, allegedly by a surface-to-air missile. The crash of Malaysia Airlines Flight 17 has been extraordinarily public. Investigators of aircraft accidents typically cordon off the scene immediately after a crash, and tightly control access for media and others to avoid disturbing the debris. 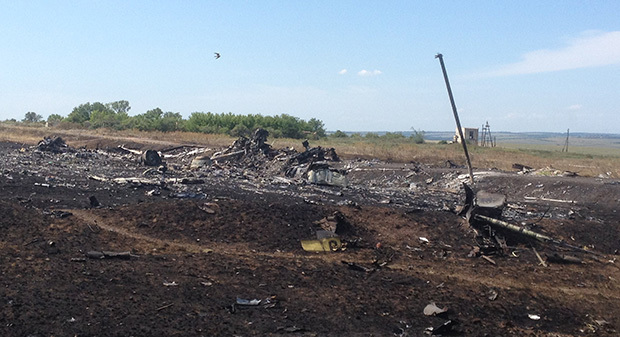 Because Flight 17 fell in a war zone —across farm fields and homes near where pro-Russia separatists are fighting the Ukraine government — control of the wreckage has been chaotic, and the comparatively sanitized photos typically released by aviation safety officials have been replaced by thousands of images distributed across wire services and social media. Mapping that wreckage is intended to illustrate how Flight 17 may have come down and the geographical challenges of conducting an investigation in a war zone. The jet's vertical tail with the Malaysia Airlines logo lies just down the road from the aft fuselage section to which it was once attached. 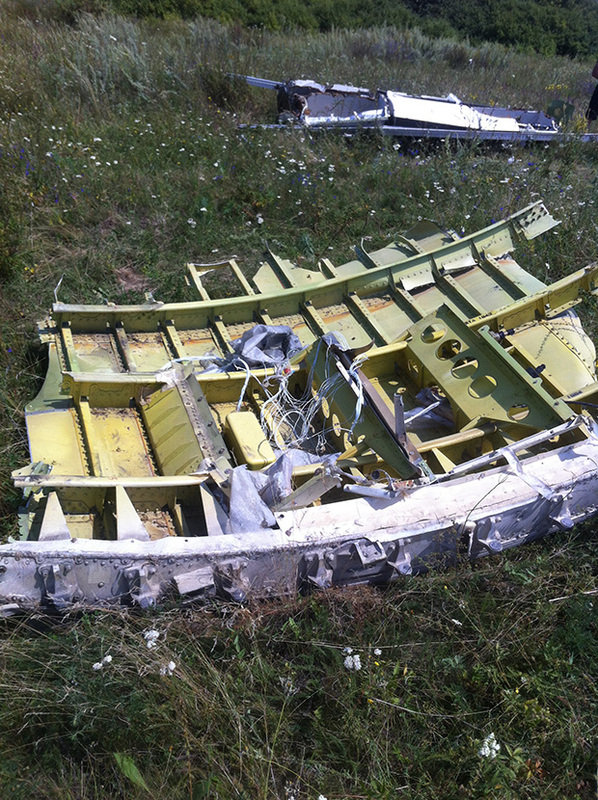 One of the most intact pieces of Flight 17 is a portion of the aft fuselage of the Boeing 777. 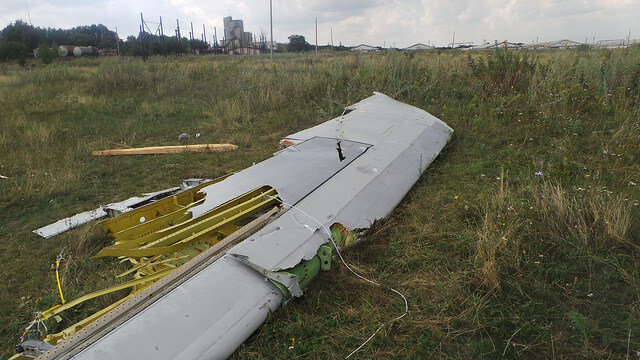 This rear part, which attaches to the rest of the jet's body behind the passenger cabin, landed upside down next to a road in Hrabove, near what was left of the connection between the jet’s horizontal tail, a wing on the tail that points the nose. 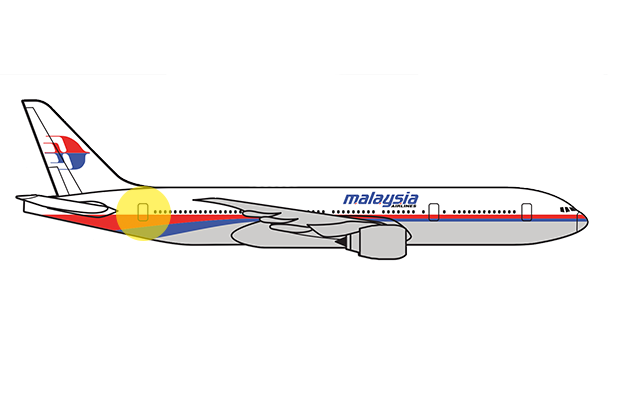 One of the carbon-fiber-composite horizontal tails was severed and found roughly 1,200 feet away in a grazing field. 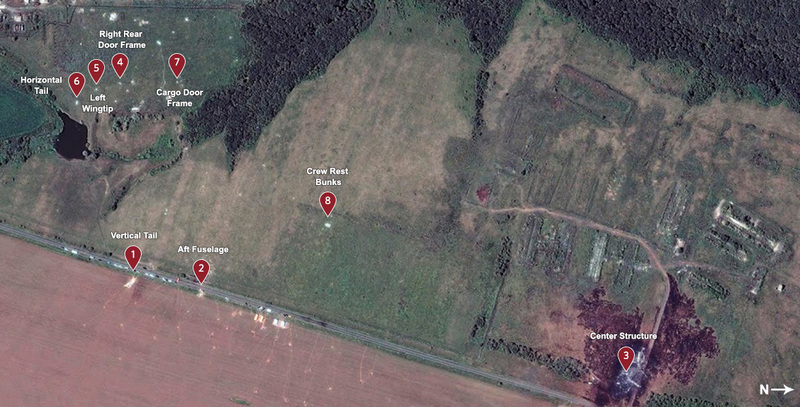 The single largest and most concentrated debris field is along a roadside in Hrabove, more than five miles east of the western edge of the documented debris field. 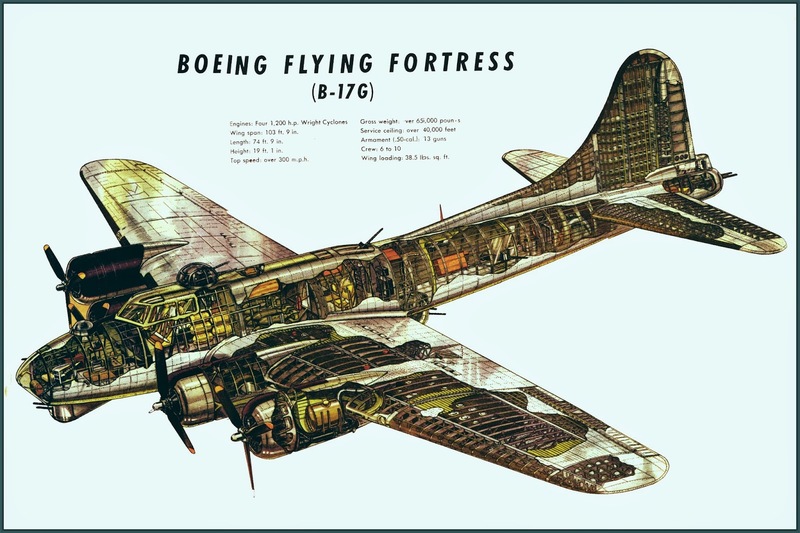 The underside of the wings is visible in the wreckage, identifiable by access holes used by manufacturing and maintenance crews to work inside the fuel tanks. In the charred debris field are parts of both of the jet's Rolls-Royce engines and a major structure called the center wing box that connects both wings to the fuselage and the well that holds the main landing gear. The landing gear was tucked inside the jet when it was cruising at 33,000 feet. 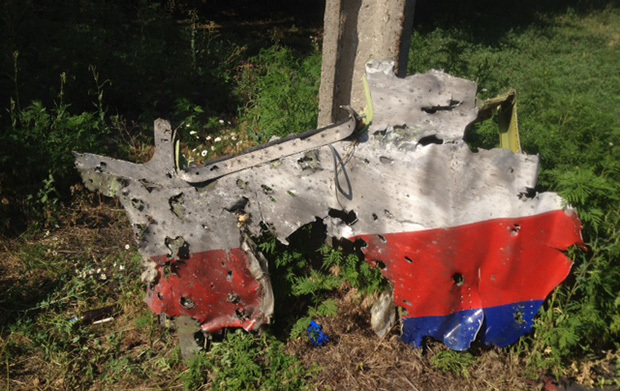 A cattle pasture in Hrabove is littered with pieces of the jet's fuselage skin. 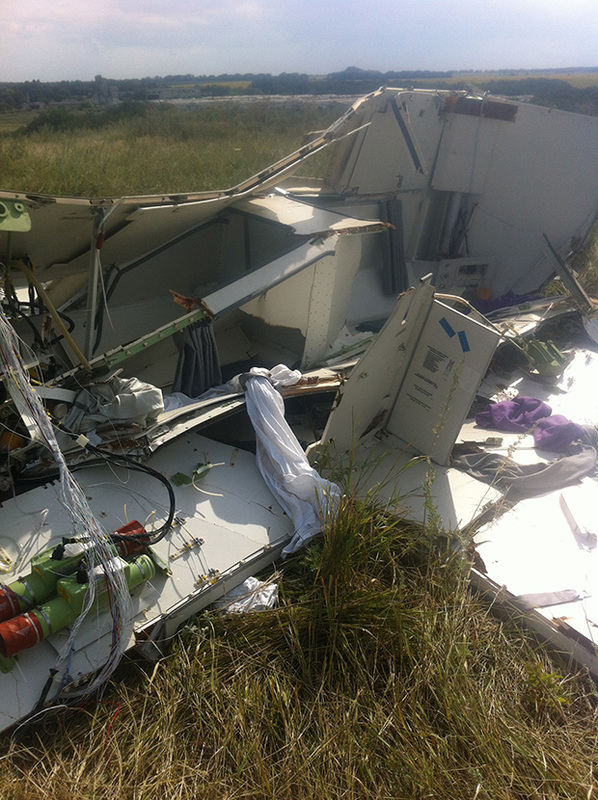 A part of the right side of the rear passenger cabin at the last set of the jet’s doors sits mangled, its door missing. The skin shows the identity of the Boeing 777, with the Malaysian registration 9M-MRD. 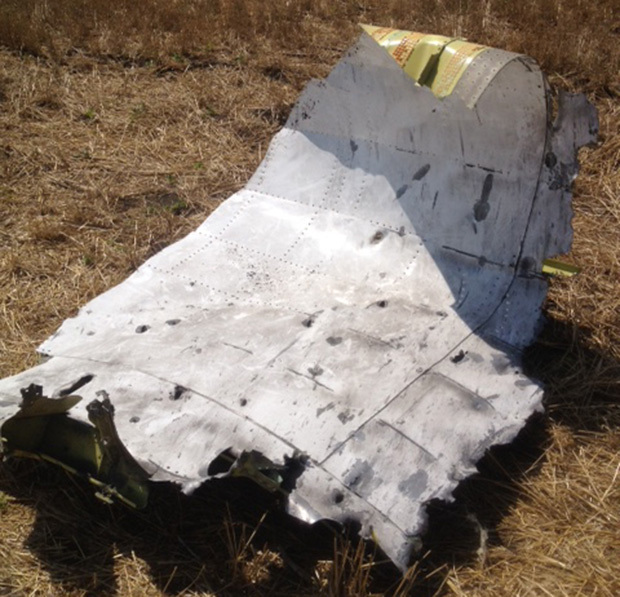 The remains of the left wingtip, with visible signs of what appear to be shrapnel or puncture damage, sits severed from the rest of the wings, which fell and burned more than a half mile away. 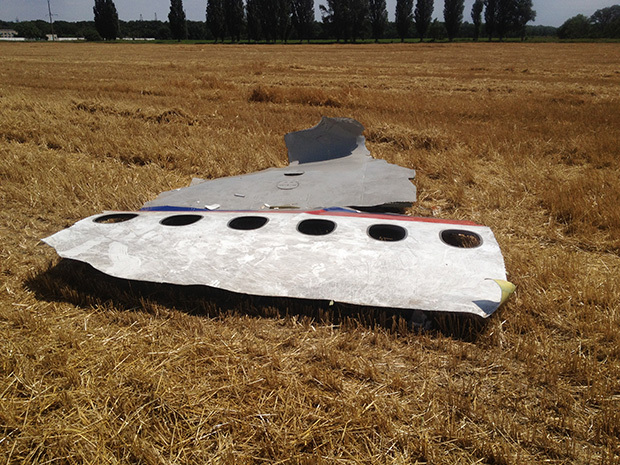 The carbon-fiber-composite horizontal tail landed a few feet away from the remains of the wingtip near a small pond. Partially covered in mud, the tail was pulled from the nearby pond, according to one photographer. 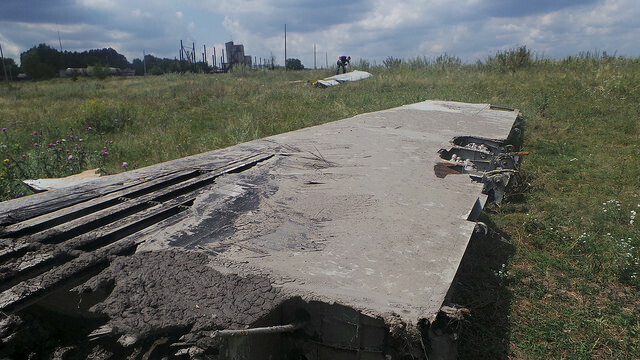 Scattered pieces of the rear fuselage, like this one around the aft cargo bay, litter a field in Hrabove a half-mile from the largest concentration of debris containing the charred remains of the jet's center structure and wings. 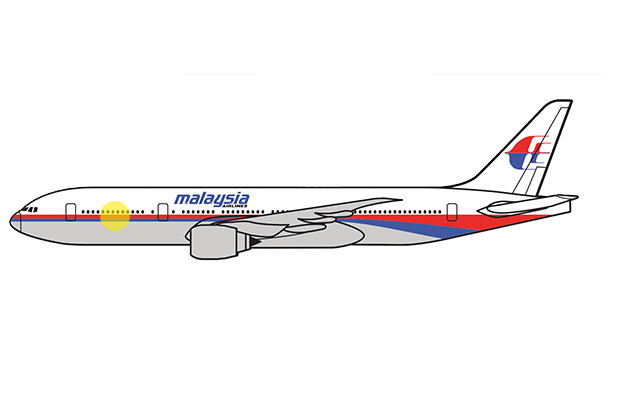 On long-range flights like those connecting Southeast Asia to Europe, cabin crews use rest bunks to work in shifts. Malaysia Airlines installed its berths underneath the floor of the 777 at the front of the rear cargo bay. 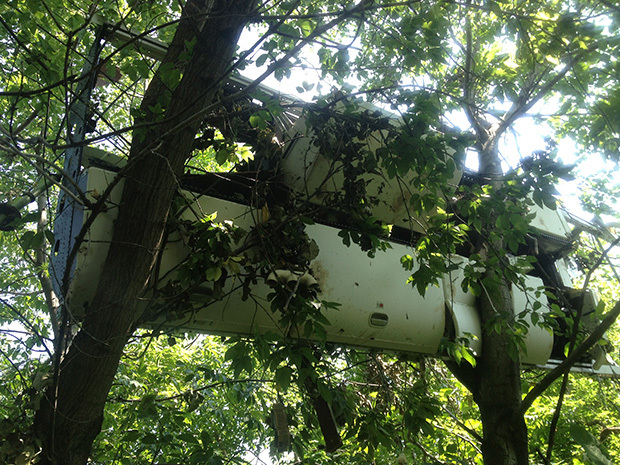 The under-floor bunks and their contents landed in a field about 1,800 feet from the main debris site in Hrabove. 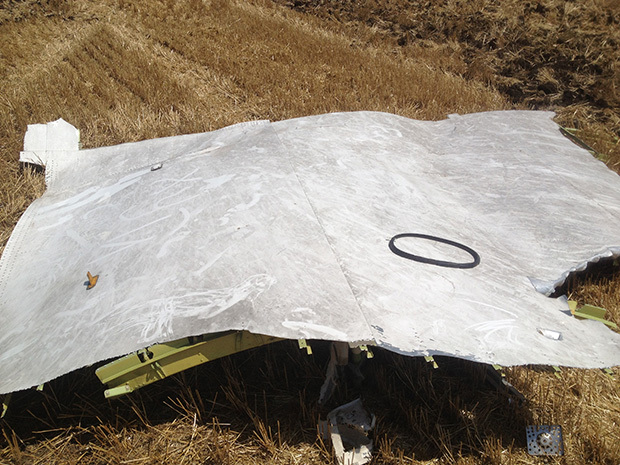 The Boeing 777’s cockpit and lower nose section landed in a sunflower field in Rozsypne, approximately 1.6 miles from the cargo floor section to which it was once attached and nearly four miles from Hrabove. The remains of the flight deck, its floor, displays and pilot controls were strewn nearby. Personal effects from the passengers and crew litter the site. The jet’s avionics components and wiring from the under-floor electronics bay were crushed into the nose landing gear, which became separated while it was tucked up into the forward wheel well. 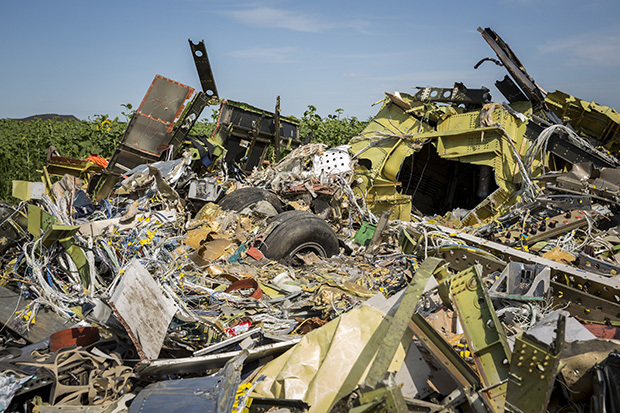 The jet’s lower forward cargo floor landed nearly five miles from the main debris field in Hrabove on a side road in the town of Petropavlivka. Local residents collected debris littered across the neighborhood and deposited it on this section of the aircraft that was once part of the forward cargo bay. Bundles of wires, air ducting, the nose landing-gear bay door and even demolished drink carts now sit on top of the silver rollers that make up the lower belly of the Boeing 777. 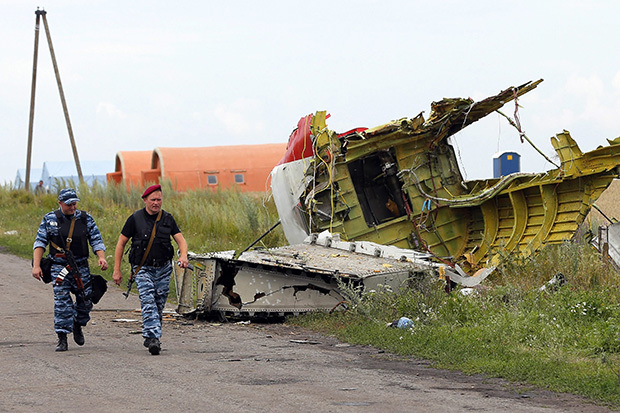 Indications of the jet's pre-crash breakup are overhead bins that landed in the town of Petropavlivka, just under five miles from the center portion of the jet, where they were once installed. A passenger's in-flight entertainment system screen is seen hanging from the ceiling, next to exit-door lighting that comes on in an emergency. These bins came from the left side in economy class, near the third of four sets of doors on the Boeing 777. 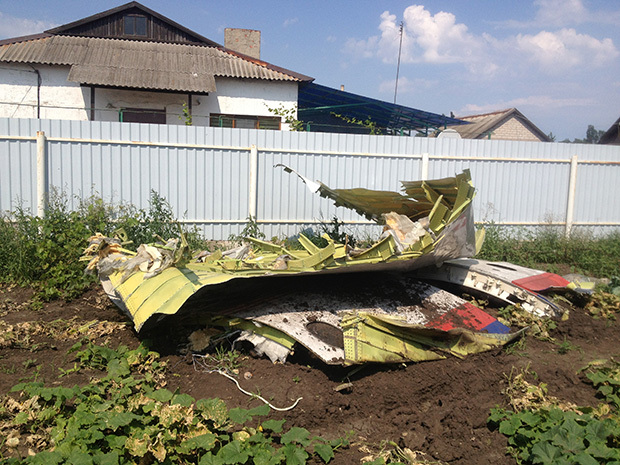 An early sign of what felled Flight 17 turned up in Petropavlivka, propped up against a concrete post in a small residential neighborhood. A white, red and blue piece of twisted aluminum that once made up the structure just underneath the captain's side window of the flight deck is pocked with holes that resemble shrapnel damage. Part of Flight 17's fuselage used as the main boarding entryway on the left-hand side of the Boeing 777 landed in a cabbage patch. The area around the door frame structure wears the remnants of the airline’s branding at the second of four of the jet’s doors. The door on the right-hand side of the aircraft was found in a field around 0.4 miles away. 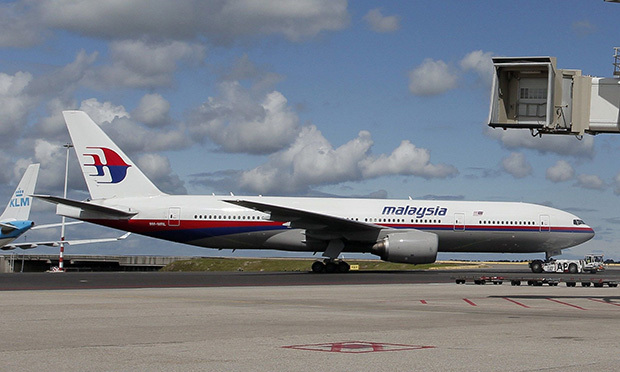 Pieces of the under-wing pod that holds the right Rolls-Royce Trent 800 engine were found nearly 4.7 miles from Hrabove, where both engines were found. Photos of debris show the broken remains of the Rolls-Royce logo and indications of piercing damage. 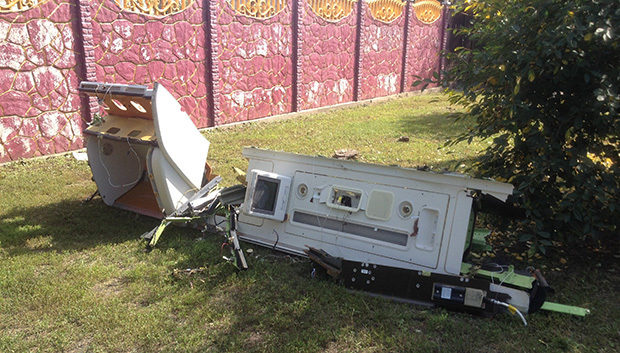 Other overhead bins were found sitting in a tree across from the Petropavlivka village hall. The Row 2 markings on the bins indicate they came from the business-class cabin. The Malaysian flag adorns the mangled fuselage panel that was once the structure around the second of four doors, which remained in place on the right side of the 777 after the fall from 33,000 feet. The corresponding structure on the left-hand side of the aircraft was found in a garden about 0.4 miles away. The exact sequence of Flight 17's fall to earth is still unclear, but the wide dispersal of debris across the three towns is indicative of a high-altitude breakup. 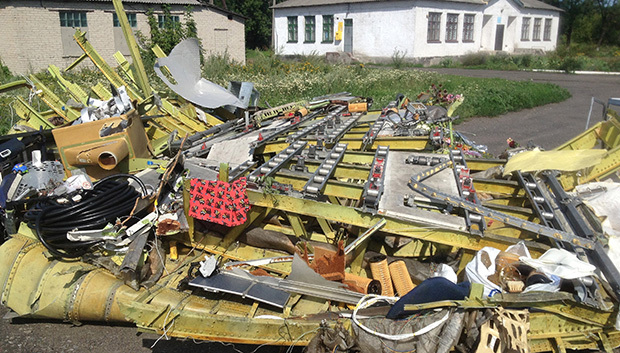 A cluster of pieces of the jet's forward fuselage roof landed in wheat fields in Petropavlivka around five miles from the end of the documented debris field. 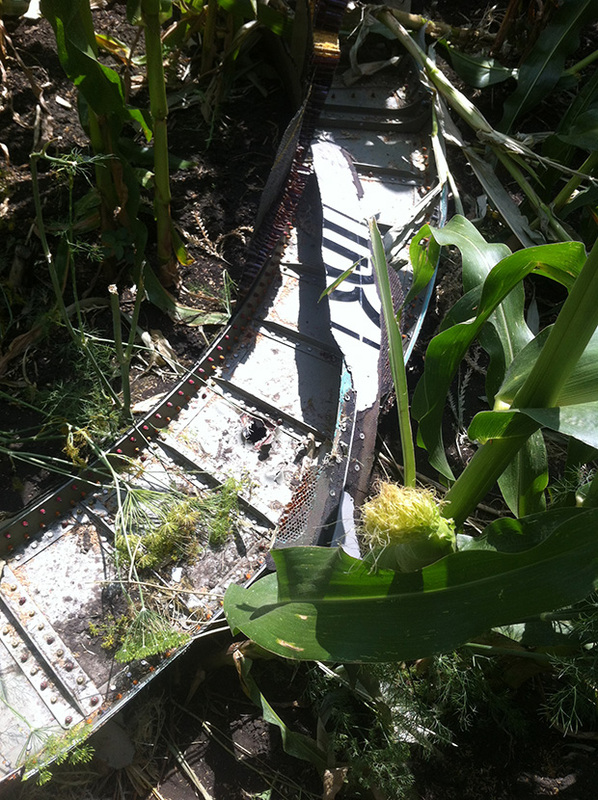 The violence of Flight 17’s destruction is evident in how it came to rest after its fall from 33,000 feet. 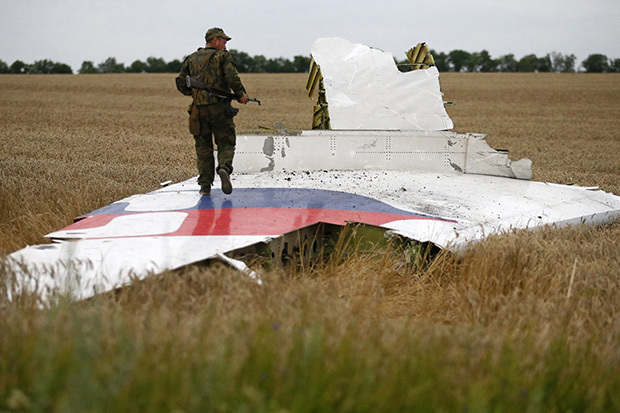 The white-painted skin of the forward fuselage is pocked with what appear to be shrapnel holes. This piece, when installed on the aircraft, is just behind and above the pilot’s flight deck windows in the side or upper ceiling. 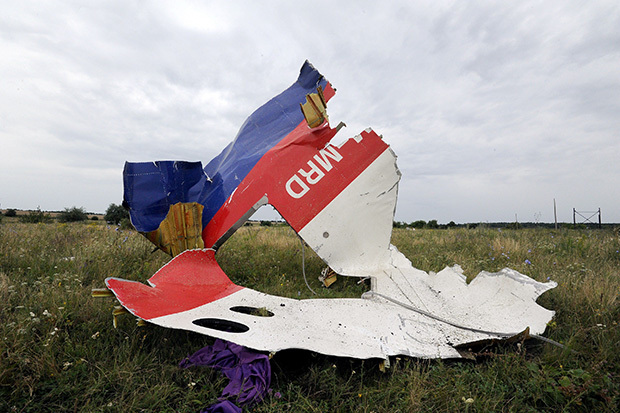 A large piece of the left side of the forward fuselage bearing Malaysia Airlines red, blue, white and gray colors landed near other forward fuselage pieces across wheat fields in Petropavlivka. 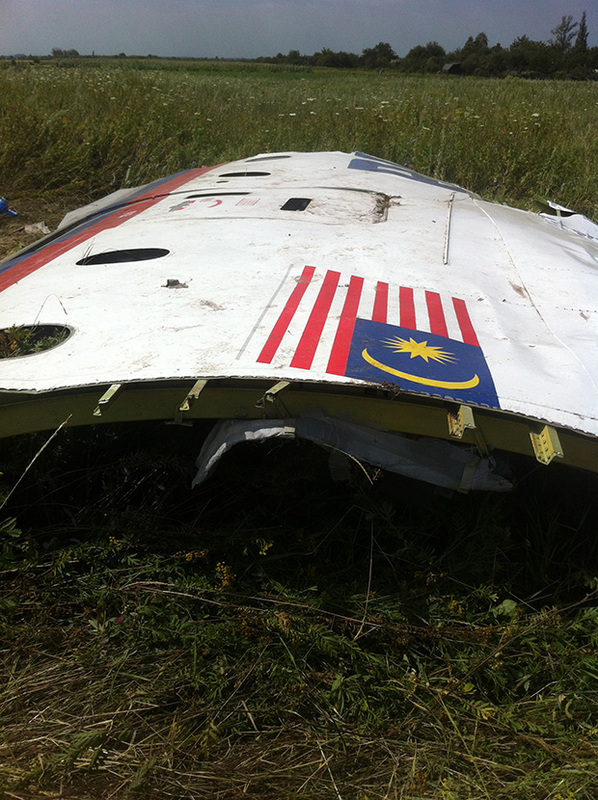 The broken, outward-bent edges of the panel may be a key clue for the investigation, potentially indicative of an explosive decompression, which Ukrainian officials said occurred after Flight 17 was allegedly hit. Wstrząsająca rozmowa ginekologa z gimnazjalistką. Trauma na całe życie. Czy tak wygląda obraz współczesnej 14-latki? D: Co teraz mam z tym zrobić? G: Z czym moja droga? D: Niech Pani z tym coś zrobi !!!! G: Musze porozmawiać z Twoją mamą. Gdzie ona? D: W domu. Kazała m tu przyjść i zrobić porządek! G: W takim razie powiedz mi, gdzie ojciec dziecka. Skąd ta wczesna ciąża? Postaram się Ci pomóc. D: Brzuch mam ze słoneczka! G: Nie rozumiem. Ale domyślam się że spotkałaś się ze swoim chłopakiem w restauracji "Słoneczna"? D: Nie! To wszystko przez słoneczko. D: To taka zabawa gimnazjalistów. G: Możesz mi ją wytłumaczyć? D: Najpierw pijemy po 2 puszki piwa. Potem dziewczyny kładą się na podłodze głowami do siebie, tworząc s ł o n e c z k o. Chłopacy kolejno odbywają stosunek z każdą z nich. Kto pierwszy się zmęczy, ten odpada. Fajnie! Tylko teraz ten brzuch! Ten przypadek, to patologia. Margines. Nie zmienia to faktu, że kiedyś takie sytuacje nie miały miejsca, a dziś - co chwile słyszmy o seks-aferach w gimnazjach. Dziewczyny, które w tak młodym wieku "bawią się" kontaktami fizycznymi, potem mają problemy w normalnym, dorosłym życiu z seksem - unikają chłopaków, nie potrafią uciec przed wspomnieniami, jest to dla nich trauma, która ciągnie się za nimi c a ł e ż y c i e.
Rozumiem, że współczesna młodzież jest atakowana zewsząd seksem... ale gdzie się podziały wartości, które powinny im wpajać rodzice? Ja, mając 14 lat, co najwyżej marzyłem, żeby gdzieś z ziomkiem ukradkiem napić się p i w a. Tak po prostu, jako owocu zakazanego. Wolałem uganiać się godzinami za piłką, a s e k s... była to czysta abstrakcja - dużo już wiedziałem, a praktykę zostawiłem na później. I za nic nie zamieniłbym tamtych czasów. Przerażające.. Tak to niestety teraz wygląda- jest coraz gorzej. Ciekawa jestem kiedy o takich "zabawach" zaczną myśleć przedszkolaki... O___o A Twoja puenta jest fantastyczna- ja za każdym razem, patrząc wstecz, na siebie, kiedy miałam 14 lat, myślę dokładnie to samo- że za nic w świecie nie zamieniłabym tego czasu, kiedy byłam głupiutka, naiwna i niewinna. Bo chyba tak powinna wyglądać 14.to latka..
LOL... a mówiłem dyrektorce (jak mnie 4 lata temu chciała wywalić z budy za wyrzucenie kwiatka w kolegę piętro niżej), że my jesteśmy normalni. To ci młodsi co przyjdą będą szurnięci. Rofl... za 20 lat do gimnazjum będzie chodziła sama elita takich "mózgów". Przepraszam bardzo wy macie po 40-50 lat ze w waszych czasach było inaczej?? ja mam obecnie 20 i jak miałem te 14-16 lat słyszałem o znacznie młodszych dziewczynach w ciąży jedna nawet była moja sąsiadka....Ten przypadek to faktycznie patologia ale czy to winna tej dziewczyny?? gdzie są rodzice? macie racje za 20 lat w gimnazjach będą same takie osoby bo to wy będziecie rodzicami;] problem nie leży w młodzieży a w rodzicach. w dupach im się poprzewracalo.. dzieciom. a za sprawą rodziców..
czy ktoś mi może powiedzieć co to w znaczy: "zrobić pożądek"? tak to jest gdy dzieci mają dzieci.. ..a te dzieci mają dzieci..
Przepraszam bardzo, ale grubo sie mylisz mowiac, ze "za Twoich czasow bylo inaczej". Zepsucie i perwersja byly i 20, i 40, i 60 lat temu, tylko wtedy sie o tym nie slyszalo, bo nie bylo to naglasniane, nie bylo tez takiego dostepu do informacji jak teraz (internet). Moge Cie zapewnic, ze obecnie tez wiekszosc gimnazjalistow marzy najwyzej o "wymknieciu sie na piwo", a seksualne zabawy im nie w glowie. A ta garstka patologii co sie bawi w "sloneczko" jest i teraz, i byla dawniej. buhahahahahahahahahaha (moja reakcja na artykuł) ............... młodzież w gimnazjum ma wiadomo z racji wieku sieczkę w głowie, ta cała sytuacja wynika to z braku zainteresowania rodziców, olewającego podejścia wychowawców i lady gaga, gagi albo jak tam na nią wołają :). A poza tym cała sytuacja jest wręcz śmieszna, ja na miejscu rodziców dziewczyn z brzuszkiem stwierdził bym następujące słowa : " Curuniu skoro czujesz się na dorosłą i zaszłaś w ciąże to teraz zbieraj swego fagasa co nie potrafi trzymać kutasa na uwięzi i wyp****alaj z domu, jak zrobił to teraz jak na prawdziwego faceta przystało niechaj weźmie odpowiedzialność ". a może jest w tym wina szkolnictwa?? bo generalnie problem " wyszedł" gdy wprowadzono gimnazja, za duży spend różnych dzieciaków, nauczyciele nie sa w stanie poznać wszystkich dzieci, a i rodzice nie są w stanie kontrolować z kim się dziecko spotyka.... bo praca, bo bez stresowe wychowanie, bo rodzice ulegają modzie, że jak "mojego kochanego dziecka koleżanka ma, to moje dzieciątko też musi mieć, bo przecież nie może być gorsze", czasami trzeb się nauczyć mówić własnemu dziecku NIE. "Słoneczko", "gwiazda" czy jak to jeszcze zwać... Żadna nowość. Jedna z zabaw z wiktoriańskich burdelów. Tylko szkoła to nie burdel [w założeniu]. Skoro morale upadły należałoby uczyć jak zapobiegać ciąży - nawet w tak ekstremalnych przypadkach. Kogo winić za całą sytuację? Rodziców - brak czasu dla "pociech", media - seks jest wszędzie, dopiero gdzieś dalej są nauczyciele. Czysta hipokryzja - tworzenie tabu na sprawach uważanych za niemoralne lecz masowo praktykowane. "za moich czasów" conajwyzej bawiono sie w butelke i dla mnie niesamowicie stresujace było jak miałam cmoknąc chłopaka w policzek! nie mowa o ustach, całowanie z jezyczkiem nie wchodziło w gre (mówie o imprezach na ktorych ja bywałam i zabawach w które "my" sie bawilismy)..
nie no! słoneczko było zawsze!!! bankowo!!!! Fakt kłopoty z dzieciakami zaczęły sie po wprowadzeniu gimnazjów. Szczawie, kiedy mają burzę hormonów i najgłupszy wiek są najstarsi w szkole i wiodą prym bo nikt im nie podskoczy i są przykładem dla młodszych gimnów.Dawniej taki łepek trafiał w tym czasie do nowej szkoły gdzie prym wiedli dużo starsi no i mądrzejsi i taki mleczak siedział cicho nie mógł im podskoczyć, zanim wyczaił co i jak to mijał rok czy dwa, hormonki się uspokajały, delikwent doroślał. Nie bez znaczenia był również obowiązek nauki do 16 roku życia nie jak teraz do 18 roku. Jak Mleczak za bardzo dymił to bez problemu delikwenta wywalano ze szkoły a teraz Mleczak może dymić do woli nikt go nie wywali z budy najwyżej przeniosą do innej szkoły i to z wielkim bólem a jak Mamusia powie nie to dyro nic nie może zrobić. Tak Se zreformowaliśmy szkolnictwo, że wychowujemy sobie jak to ujął jeden z kabaretów młodocianych przestępców bo nie chcemy dzieciom w ich najgłupszym okresie fundować stresu zmiany środowiska szkolnego rozdzielać paczki gimnów, jak widać z perspektywy czasu ten stres wychodził szczawiom na zdrowie. Powstaje pytanie na co tak wychowana młodzież wpadnie jak będzie miała np. 30 lat? Zabawa interesująca, pewnie podniecająca i szybko koniec. no i pomyślmy co dalej? Jak potem znaleźć coś, co podobnie podnieci i potem kolejne..? Ha[!] no nieźle.... Jestem teraz w średniej szkole ale pamiętam jeszcze jakim wstydem było nie być dziewicą;D:P a jeszcze nie daj Boże ktoś się o tym dowiedział to totalna patologia była..wytykanie palcami i te sprawy..
Jestem ojcem 10 miesięcznej córeczki i martwi mnie jak ją bedę umiał chronić przed taką patologią.Gdzie sa rodzice tych dzieci?! ahhhh ..... i to nie jest wina rodziców bo mam koleżanke z klasy która chwali sie ze bóg wie co robiła chłopakowi.....hahah xD szmata i nic wiecej....po prostu chce sie popisać przed innymi.......wole być dziewicą do 18-nastki niż zajść w ciąze za 15 lat !!!! SZOK!!!!!!!!!!! Dokąd ten świat zmierza.... chyba do końca, bo to co się dzieję, to trudno sobie nawet wyobrazić!!! Tylko gdzie są rodzice tych dzieci, bo to przecież jeszcze dzieci!! Obwiniamy o wszystko o młodzież bo taka jest, ale jacy my jesteśmy dorośli, a mam na myśli rodziców tych gimnazjalistów!!!!!!!!!!!!! !szok szok szok!!!!!!!! Jestem matką 18-latki, więc mam matczyne doświadczenie. Jedno wam powiem ! Z dziećmi trzeba rozmawiać i wychowywać je od urodzenia, nie kiedy ma 7-, 12 lat! wtedy jest już za późno. Moja córka jest wspaniała! Nigdy nie musiałam przeżywać jej dojrzewania. I tego wam życzę! Jak czytam te komentarze i treść tego wszystkiego to mi się normalnie niedobrze robi. Sama mam 14 lat lecz mimo tego wydaje mi się to chore. Osobiście mam niezły kontakt z rodziną i jest mi z tym dobrze. W życiu bym nie przeżyła gdybym w tym wieku zaszła w ciążę. Takie nastolatki przeważnie żyją swoim życiem. Olewają wszystko i wszystkich, bo rodzice robią to względem nich. W moim przypadku, gdy jestem zżyta z rodzicami nie próbuję robić jakichś głupstw i co najważniejsze mam wobec nich zachowany SZACUNEK. Po wypełniającym cały poprzedni wieczór pogotowiu, w poniedziałek 18 września od wczesnych godzin porannych na stanowiskach samolotów trwała wytężona praca. Mechanicy dokonywali pośpiesznie ostatnich przeglądów samolotów, tankowano paliwo oraz zaopatrywano uzbrojenie bombowców w amunicję. W tym czasie załogi, wyrwane ze snu o godzinie trzeciej, zjadły śniadanie, pobrały wyposażenie składające się z masek tlenowych, spadochronów oraz zestawów na wypadek awaryjnego lądowania i już gotowe udały się na odprawy, prowadzone oddzielnie dla poszczególnych członków załóg: pilotów, bombardierów, nawigatorów oraz radiooperatorów. Wstępna odprawa należących do 355 Grupy Myśliwskiej pilotów odbyła się jeszcze w dniu 12 września. Omówione zostały między innymi: ogólna sytuacja polityczna i militarna w Warszawie oraz oczekujące grupę zadania. Pilotom polecono pozostawienie broni bocznej, niewdawanie się w dyskusje polityczne z Rosjanami, a w przypadku awaryjnego lądowania na terytorium będącym w ich posiadaniu zakazano podejmowania dalszych samodzielnych akcji oraz zalecono pozostanie w kabinie samolotu. Załogi uprzedzono także o spodziewanej obecności myśliwców rosyjskich, które miały operować poniżej bombowców. Aby służyć ewentualną pomocą, do 100 Grupy Bombowej dołączyli oficerowie wywiadu z 355 Grupy Myśliwskiej Danny M. Lewis oraz por. E. H. Mc Millan. Dzisiejsza ekspedycja jest bezpośrednim wynikiem konferencji naszego Prezydenta z premierem Churchillem w Quebec. Doszli oni do wspólnego wniosku o konieczności wzmożenia pomocy Warszawie. Nasza dywizja bombowa już trzykrotnie brała udział w operacjach tego rodzaju, dokonując zrzutów broni i amunicji dla francuskiego Maquis. Pamiętacie jak szczodrze byliście wynagrodzeni zyskanymi wynikami za pomoc, jaką daliście francuskiej Armii Podziemnej. Dziś podobnej pomocy oczekuje od was Warszawa, która od wielu tygodni walczy z Niemcami i odczuwa dotkliwie brak broni i amunicji. Nad Warszawą spotkacie lotnictwo myśliwskie sowieckie, a po dokonaniu lotu lądować będziecie w Rosji51. Później oficer poinformował zebranych, że zrzuty mają być dokonywane w dwóch miejscach, a samoloty zostały podzielone na odpowiednie grupy, którym przydzielono po jednym z tych rejonów. W tym czasie załogom zaprezentowano mapę Warszawy, podając, które części miasta znajdują się aktualnie w rękach AK oraz w jaki sposób dokonać ich skutecznej identyfikacji. W dalszej części odprawy ten sam oficer przedstawił przewidywaną sytuację meteorologiczną. Według prognoz jedyne trudności miały występować wyłącznie nad Anglią, gdzie spowijająca lotnisko mgła mogła utrudniać kołowanie i start maszyn. Przewidywane dotarcie wyprawy nad cel miało nastąpić pomiędzy godziną trzynastą i czternastą, a samo lądowanie w Rosji o godzinie szesnastej52. Chociaż przytaczana relacja o tym nie wspomina, w trakcie odprawy nie zabrakło także na pewno standardowych informacji o czasie uruchomienia silników, kolejności kołowania, używanych częstotliwościach radiowych, trasie dolotu, punktach początkowych i samym kursie. Nie jestem historykiem (…). Ale wszyscy znamy nazwisko Kościuszko, który był Polakiem i wziął udział w wojnie wyswobodzenia Ameryki. Dzisiaj macie sposobność odwdzięczenia się Polsce za to, co on dla nas wtedy zrobił. Jestem przekonany, że z tej sposobności wszyscy chętnie skorzystamy. Po zakończeniu odprawy załogi zostały rozwiezione do miejsc postoju swoich bombowców. Ubrani w wiele warstw ubrań i obciążeni spadochronami lotnicy nie bez trudu zajmowali miejsca w samolotach. Wkrótce potem rozpoczęła się rutynowa procedura uruchamiania silników i sprawdzania radia. Wreszcie, sunąc wolno po pasach startowych, bombowce ustawiały się kolejno na drogach kołowania i startowały w 30-sekundowych odstępach. Dowódca: płk Karl Truesdell Jr. – dowodzący całością wyprawy. Baza 119, Horham, hrabstwo Suffolk. Dywizjony: 334, 335, 336, 412 – 36 samolotów. Dowódca: ppłk Thomas S. Jeffrey. Baza 174, Thorpe Abbotts, hrabstwo Suffolk. Dywizjony: 349, 350, 351, 418 – 38 samolotów. Dowódca: mjr William J. Jones (dowódca 570 Dywizjonu, 390 Grupy Bombowej). Baza 153, Framlingham (Parham), hrabstwo Suffolk. Dywizjony: 568, 569, 570, 571 – 36 samolotów. sprzęt medyczny – 12 zasobników. Spokojnie , kto ewakułował się z systemu bankowego ten śpi spokojnie. Moja drobna rada w bankach trzymać tylko tyle by zachować płynność I nic więcej, w/g moich obliczeń ta piramida finansowa spokojnie wytrzyma jeszcze 6 miesięcy a potem już rozwałki nic już nie zatrzyma. w sumie to bardzo dobre wiadomości, kto się ustawi na odpowiednim miejscu ten wypłynie na szerokie wody (w/g moich obliczeń 79 % społeczeństwa pujdzie na dno),a jak wybuchnie rewolucja to tym lepiej(przynajmiej dla mnie). Międzynarodowy Fundusz Walutowy już dwa lata temu ostrzegał, iż odpisy z tytułu niespłacalnych długów w europejskim systemie bankowym sięgną 2 bln USD. Realne straty zapewne są większe lecz zasady księgowości stworzone w 2008 roku pozwalają bankom księgować aktywa wg ceny nominalnej nawet jeżeli ich cena rynkowa jest znacznie niższa. W ostatnich dwóch miesiącach problemy banków zakamuflowane przez ostatnie lata wydają się coraz bardziej uwidaczniać i to w miejscach, w których najmniej bym się tego spodziewał. Wszystko zaczęło się na początku czerwca w Bułgarii, gdzie czwarty największy bank KTB na skutek problemów z płynnością zawiesił działalność. Po ponad miesięcznym śledztwie wychodzą na jaw coraz to ciekawsze informacje odnośnie wywożenia gotówki czy niszczenia dokumentów. Rzeczywistą skalę strat jest trudno oszacować jednak na dzień dzisiejszy wiadomo, iż bank został pozbawiony licencji i najprawdopodobniej zostanie ogłoszona jego upadłość. Nie wiadomo jeszcze co się stanie z depozytami ulokowanymi w KTB, które w większości pochodziły od osób fizycznych. Oficjalnie mówi się, że wkłady do 100 tys. euro mają być wypłacone z rezerw banku centralnego jak i odpowiednika BFG. Póki co przed oddziałami banków ustawiają się kolejki w nadziei na odzyskanie wkładów. Łączna wartość zamrożonych depozytów sięga 3,7 mld Euro i najprawdopodobniej do 20 września ich właściciele nie będą mieli dostępu do środków zdeponowanych na kontach. Problemy zapoczątkowane przez KTB już przełożyły się na kolejny bank - Pierwszy Banku Inwestycyjny będący trzecią największą instytucją finansową w Bułgarii. Bank po przerwie spowodowanej brakiem płynności na chwilę zawiesił działalność po czym w trybie pilnym został zasilony kwotą 1,7 mld Euro z EBC. Problemy sektora bankowego także poważnie dotknęły Portugalię. W grudniu zeszłego roku opublikowano raport mówiący, iż grupa finansowa Espirito Santo International jest nadmiernie zalewarowana i zbyt zależna od sprzedaży instrumentów dłużnych. Co więcej, aktywa banku są znacznie zawyżone w stosunku do realnej wartości. Mija pół roku i mamy efekt. 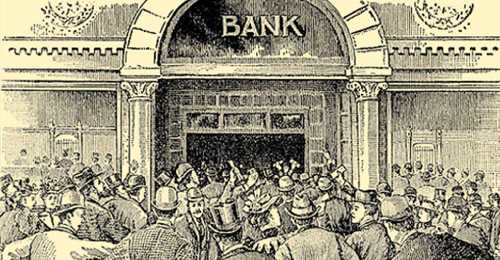 W zeszłym tygodniu największy bank Portugalii Espirito Santo należący do wyżej wspomnianej grupy ogłosił, iż nie jest w stanie wykupić na czas własnych obligacji. Giełdy zareagowały błyskawicznie. W trakcie jednego dnia akcje spółki spadły o 17%, po czym zawieszono notowania. Przez kolejnych kilka dni próbowano ratować sytuację, po czym głównemu wierzycielowi odsprzedano 4,99% akcji banku aby ratować się przed bezpośrednim bankructwem. Problemów to nie rozwiązało. Japońska grupa finansowa domaga się natychmiastowej spłaty 100 mln Euro pożyczki udzielonej Grupie Finansowej Santo na wykup akcji banku. Efekt problemów z płynnością szybko się rozprzestrzenia. Kolejna firma należąca do grupy Espirito (Rioforte) ma problem ze spłatą 850 mln Euro dla Portugal Telecom. Na szybko Rioforte próbuje pozyskać kapitał wyprzedając różne aktywa lecz jak zawsze w takich przypadkach możliwości są bardzo ograniczone. Na razie firma wystąpiła do sądu o ochronę przed wierzycielami. Złych wiadomości nie koniec. Problemy dotknęły także austriacki Erste Bank , który ogłosił, że źle skalkulował straty z tytułu złych kredytów. Wg najnowszej prognozy straty są o 40% wyższe niż pierwotnie przewidywano i wynoszą 2,2 mld USD. Mimo strat kapitalizacja banku jest dobra lecz moim zdaniem, rewizja strat nie jest ostatnią. Problemy banków w Europie doskonale odwzorowuje zachowanie indeksu reprezentującego europejskie banki, który spadł o 11% od początku czerwca. Dzieje się tak gdyż problemy banków z jednego kraju natychmiast przekładają się na inne kraje. Obecnie mamy system bankowy wzajemnie powiązany jak nigdy dotąd. Inwestorzy doskonale zdają sobie z tego sprawę lecz media za każdym razem powtarzają, że mamy do czynienia z odosobnionym przypadkiem. W obecnym świecie nie ma czegoś takiego jak odosobniony przypadek. Zobrazuję to na poniższym przykładzie. Portugalski bank emituje obligacje aby pozyskać kapitał. Aby uwiarygodnić się w oczach kupców obligacji ubezpiecza w banku z Francji. Obligacje w całości wykupuje instytucja finansowa z Niemiec. Nagle bank Portugalski ogłasza, że nie jest w stanie wykupić owych obligacji. Depozytariusze natychmiast wycofują środki. Inne instytucje finansowe odmawiają finansowania. Bank nie mając wyjścia zawiesza działalność przechodząc na tzw. survival mode. Od tego momentu zablokowane zostają jakiekolwiek wypłaty depozytów a politycy razem z przedstawicielami banku centralnego zastanawiają się jak rozwiązać problem. Posiadacze obligacji (firma z Niemiec) kieruje wniosek do banku z Francji o wykup obligacji gdyż instytucja ta je ubezpieczała. Bank z Francji odmawia gdyż bank z Portugalii formalnie nie upadł. Politycy z Niemiec, Francji oraz Portugalii zaczynają rozmowy jak rozwiązać kryzys. W międzyczasie kłopoty ogłasza instytucja z Holandii, która poprzez kontrakty terminowe grała na wzrost ceny obligacji podczas gdy ich ceny dramatycznie spadły. Lewar 1:40 okazał się zabójczy zarówno dla instytucji jak i jej wierzycieli. Nikt nie wie jaki będzie los czterech instytucji finansowych. Banku z Portugalii który ma problemy z wykupem obligacji. Banku z Francji, który ubezpieczył owe obligacje jak i banku z Niemiec, który nie wie czy i kiedy odzyska zainwestowane środki. Bank z Holandii także poprosił o ochronę przed wierzycielami. Zaprezentowany przykład jest ekstremalnym uproszczeniem. W rzeczywistości powiazania między bankami są dużo bardziej skomplikowane. Problemy jednego banku zazwyczaj przekładają się na inne banki i mamy reakcję łańcuchową. W obecnej sytuacji niemożliwym jest przewidzenie skutków eskalacji problemów Banco Espirito czy Erste Banku. Z jednej strony, możemy mieć nacjonalizację i wykup złych długów jak w przypadku Dexii. Z drugiej strony, problemy mogą być chwilowo zażegnane (ukryte), jak zrobiono z Deutche Bankiem. Równie dobrze jednak mały bank może zainicjować kaskadę bankructw jak stało się to z Lehman Brothers i AIG sześć lat temu. W obecnej sytuacji najlepiej unikać trzymania większych środków w bankach szczególnie tych powiązanych z Portugalią. Szczegóły znajdziecie w artykule Czy banki w Polsce są bezpieczne? Co do instrumentów finansowych to bezwzględnie odradzam akcje oraz obligacje banków jak i instytucji finansowych, w tym ubezpieczycieli. "Poki co nasze banki nie sa tak zlewarowane jak jakis Deutsche Bank, Goldman Sachs czy Morgan Stanley." Fakt, sytuacja systemu bankowego w Polsce jest jeszcze gorsza. Banki w RP nie są niezależne, to spółki-córki należące do holdingów zarejestrowanych za granicą. W każdej chwili właściciel może wyssać z takiej spółki-córki cały kapitał pozostawiając problem spłacenia zobowiązań wydmuszki (czyli zwrócenia pieniędzy klientom) polskiemu bankowemu funduszowi gwarancyjnemu. Operacja wysysania kapitału trwa kilka sekund i zanim się NBP połapie pieniądze z całego systemu całkowicie legalnie wyparują. Ten system jest tak skonstruowany, żeby właściciele polskich banków za nic nie odpowiadali. Oznacza to koniec Polski.Jednocze[nie daje odpowiedz na wszelkie w tpliwo[ci. Dowiedziałem się przed chwilą. Tragedia. Macie odpowiedz dlaczego premiera zaproszono osobno.Bo si jeszcze przyda. Specjalna komisja ustali,ze byl to nieszczesliwy wypadek. To sie nie miesci w glowie. Byłem przeciwnikiem prezydenta, nie głosowałem na niego ... ale strasznie mi przykro w tym momencie. Straszna tragedia. To nie powinno się stać. Asmagus, preferencje polityczne nie maja tu najmniejszego znaczenia. Zginal urzedujacy prezydent naszego panstwa. Ciezko poki co ogarnac ta tragedie. Szkoda Prezydenta, Wassermanna, Kaczorowskiego, Szmajdzińskiego i wielu innych. Dużo elity zginęło, nieważne jakie pochodzenie polityczne. W tym konkretnym przypadku w żadne teorie spiskowe nie uwierzę. Straszna tragedia - zostawmy politykę. Tak wlasnie wyglada polityka w ruskim wydaniu.Ciekwe,czy teraz wmowia nam jakis zamach odwetowy,aby miec pretekst do wprowadzenia wojsk do naszego kraju. Almagra, przestan prosze Ciebie dodawac tragiczne komentarze do tej tragedii. Nigdy sie nie mieszam w dyskusje polityczne a twierdzenie,że to teoria spiskowa w tym wypadku to głupota. Rosja będzie miała z tego powodu więcej kłopotów niż pożytku. Gdzie zes to przewidzial ? Teraz Ci sie wzielo na pisanie dopiero. Samolot byl po kapitalnym remoncie,ktory odbyl sie w Rosji.Na Boga, Kochani Rodacy ocknijcie sie wreszcie!!! Nie lubie takich dyskusji w podobnych okolicznosciach, ale podobne nawolywania do spiskow przerazaja mnie jeszcze bardziej. Samolot ten byl remontowany w Rosji bo to rosyjski samolot byl, nie rozbil sie on jednak (wedle danych na chwile obecna) w wyniku jakiejs usterki technicznej tylko gestej mgly, pilot podchodzil dwokrotnie do ladowania. Jestem zwyczajnie załamany i nie mam słów. To tragiczny dzień dla Polski. I drzewa były rosyjskie, poza tym Rosjanie pod lufami karabinów napakowali ich tylu do jednego samolotu. Ktoś mi przytomnie kiedy rozbiła się Cassa i jaka dyskusja była na ten temat? Prawdziwa głupota za każdym razem pokona sztuczną inteligencję. Możecie wyłączyć choć w takiej chwili tego pacjenta, mam na myśli almagra? Nikt mu nie powiedział że po nocnej balandze poranek powinien zaczynać klinem, zamiast pisaniem komentarzy w Internecie. Niech jeszcze napisze że drzewa wokół lotniska w Smoleńsku też Rosjanie specjalnie zasadzili, pajac nawiedzony. Samolot był dobry, nawet bardzo dobry na tę sytuację, bo żaden inny większy i nowocześniejszy nie wylądowałby w Smoleńsku. Podstawą katastrofy było to, że pilot miał za plecami 88 nadęciaków zamiast zwykłych pasażerów, którym może rozkazywać. Wiózł Prezydenta i dowódców, z których większość mogła decydować o jego lsach zawodowych gdyby nie podjął próby lądowania we mgle, tylko skierował samolot 250 kilometrów dalej przez co spóźniliby się na uroczystości propagandowe. Takie same były przyczyny katastrofy CASA, którym się dowództwo wojskowe rozwoziło do domów, a pilot samolotu w tamtej sytuacji musiał być w strachu i musiał się wykazywać. Być może nie miał takich "jaj" jak ten co odmówił lądowania w Gruzji chociaż mu Prezydent kazał ? A nie przyszło Ci na myśl bezpieczeństwo pasażerów? W tym momencie tym bardziej? Skoro była mgła, to tym bardziej powinien wylądować gdzie indziej. Ale po tragedii można sobie i 1000 takich scenariuszy poukładać, nie wiesz nie pisz! Co innego samo lotnisko, kompletnie nie przygotowane na takie warunki pogodowe i nie przystosowane do mglistych warunków pogodowych. Wszystko w temacie. tego pilota który nie chciał lądować w wyznaczonym lotnisku w Gruzji jego wojskowe trepiszcza z dowództwa uziemiły. Tylko Kaczyński go usprawiedliwiał, tak przynajmniej wyglądała wersja oficjalna. Czy sam wiesz o czym mamroczesz neomamut? Dla bezpieczeństwa pasażerów cztery razy podchodził do lądowania we mgle zamiast poprosić o inne lotnisko? Taki samolot jest w stanie polecieć do Moskwy w póltorej godziny, do Kijowa w godzinę a nie krążyć tyle czasu we mgle nad Smoleńskiem gdzie tylko ruski pilot mysliwski na dużej bani wyląduje bez strachu Jakiem 40. Wieszczom nawiedzonym jak almagra polecam do przemyślenia cytaz z "Ucieczki z Nowego Jorku". Na wiadomość, że prezydent zginie, Plissken odpowiada - wybierzecie nowego. Kiedyś widziałem film o rosyjskich lotniskach lokalnych. Tam wszystkie mają krótkie pasy i piloci lądują na nich z bardzo krótkim podejściem. Ale piloci Aerofłotu w większości są emerytowanymi pilotami myśliwców. Żaden pilot cywilny na takie coś sobie nie pozwoli. Nowoczesny samolot na takim lotnisku jak w Smoleńsku w ogóle nie będzie w stanie wylądować. Ze sprzecznych na razie informacji wynika że samolot robił trzy próby podejścia i rozbił się przy czwartej. Zwykle po drugiej nieudanej próbie samolot kierowany jest na inne lotnisko. Dotąd wiedziałem ze Piłsudski zmarł 12 maja 1935 roku, w obecności żony, córek, ks. Władysława Korniłowicza i premiera Felicjana Sławoja-Składkowskiego w swoim pokoju w Belwederze. Właśnie coś mówili w TV że samolot lądował w Smoleńsku na prośbę pary prezydenckiej. Wcześniej inny samolot próbujący został odwołany na inne lotnisko. to podejrzewam,że reakcja była by podobna. Oczywiscie myslalem o Sikorskim . Nie wiem skad mi przyszlo nazwisko Pilsudzkiego . Proponowali lądowanie w Mińsku, gdzie można było przeczekać do poprawy pogody. Pilot rządowego samolotu był prawdopodobnie wojskowym. Tacy piloci sa ubezwłasnowolnieni, maja wykonywac rozkazy i nie szemrać. Jeśli ktoś ważny zadysponował, że lądują w Smoleńsku więc próbował wylądować mimo mgły. Tym razem nie beda próbowali zrzucić winy na sprzet jak w przypadku katastrofy Cassa czy Herculesa - a to wojskowa metoda unikania odpowiedzialności. W tym momencie nie ma polityki - są ludzie . Ci , którzy odeszli i ich Rodziny , które zostały . Uszanujmy pamięć tych , których już nie ma i ból tych którzy zostali . Wydaje sie dziwne ze pilot tak ryzykowal . Przeciez jesli istnieje choc cien podejzenia ze cos moze pojsc nie tak jak trzeba - nie laduje sie . Pilot podejmujac kolejne proby MUSIAL miec WYRAZNE polecenie . Nie od wiezy bo ta sugerowala zmiane lotniska . Polecenie mogl wydac TYLKO prezydent . Te sugestie, że to Prezydent sam się odprawił na tamten świat są moim zdaniem nie na miejscu. Póki nie ma wyników śledztwa, nie można wyrokować. Inna sprawa, że spec-służby i tak podadzą publicznie takie informacje, jakie chcą, a nie te które mają coś wspólnego z prawdą. Byc moze nie sa na miejscu ale sa najbardziej prawdopodobne . Inna sprawa jest fakt ze wynik sledztwa NIGDY nie wykaze rozkazu sugerujacego ladowanie . Przeciez takie cos nie moze dostac sie do mediow . Powtarzanie ze to pilot decyduje ostatecznie jest idiotyczne . Pilot podlegal presji , ogromnej presji . Gdyby podjal decyzje ladowania w Moskwie czy Minsku cala delegacja spoznilaby sie na uroczystosci a raczej cale uroczystosci odbylyby sie bez polskiej delegacji . To byloby nie do pomyslenia dla Prezydenta , szesciu generalow i reszty orszaku . To bylby skandal i wstyd ! Tak wiec pilot MUSIAL dostac wyrazne wytyczne . Kropka . Z podobna sytuacja mielismy juz do czynienia wczesniej gdy samolot prezydencki ladowal 200km dalej niz powinien , decyzje wtedy podjal pilot i byly do niego OGROMNE pretensje . Laduj , a jak nie to znajdziemy sobie innego pilota ! Wielka trgedia i strata dla Polski o poważnych konsekwencjach na najbliższe miesiące a nawet lata. Co do katastrofy: była mgła, pilot zahaczył o wierzchołki drzew, widocznie zszedł za nisko przy niskiej widoczności w poszukiwaniu pasa lotniska. Na tym lotnisku lądują różne samoloty, w tym wojskowe i nadawało się ono dla tego Tu-154N. Prawdopodobnie z powodu gęstej mgły widoczność była zerowa i samolot nie powinien wogóle podchodzić do lądowania, skoro rozbił się przy 4 podejściu, a jak widaomoo lądowanie jest najniebezpieczniejszą fazą każdego lotu. Po pierwszej próbie powinien odlecieć na lotnisko w Mińsku bo automatycznie, mimo sysytemów naprowadzania wylądować nie mógł. Kiedy pilot prezydenckiego samolotu nie zgodził się lądować pod ostrzałem w Gruzji to został odsunięty od latania i grożono mu jeszcze większymi konsekwencjami. Tam latają piloci wojskowi, mają wykonywać rozkazy. Potem się opowiada bajki, że polski pilot poleci i wyląduje wszędzie, a wojsko konsekwentnie podtrzymuje ten mit. Ci którzy mogli wydać pilotowi polecenie lądowania we mgle w Smoleńsku nie żyją więc się tego nie dowiemy. Jeśli kontrola lotniska ze Smoleńska poda treść rozmów i wyjdzie, że pilot lądował na rozkaz wbrew jej zaleceniom, to wyskoczy podobny do almagra i będzie twierdził, że to jest kłamstwo. Aby powiększać zdjęcia musisz się zalogować! Temat Katynia dobrze byłoby raz na zawsze zakończyć, niestety tym razem się nie udało, wielka szkoda. Na pokładzie samolotu to kapitan jest dowódcą i najważniejszą osobą a nie pasażerowie, choćby najbardziej utytułowani, to jest chyba jasne? Więc nie ma on prawa ryzykować swojego życia ani pasażerów wobec jakiegokolwiek widzimisię i nie powinien ulegać presji, naciskom, namowom czy prośbom osób postronnych. W obliczu zagrożenia ma prawo zignorować rozkazy i inne sugestie jeśli zagrażałoby to życiu załogi i pasażerów czy bezpieczeńswtu lotu. Dzięki temu właśnie nie dochodzi do poważniejszych wypadków i katastrof. Lotnictwo rządzi się bardzo ścisłymi zasadami, tak jak np. kolej (co może się komuś wydawać dziwne, że taki przykład podałem, ale tak jest). Ogromna strata dla rodzin i dla Polaków. Dalej pilot samolotu jest drugi po bogu. >>Kiedy pilot prezydenckiego samolotu nie zgodził się lądować pod ostrzałem w Gruzji to został odsunięty od latania >>i grożono mu jeszcze większymi konsekwencjami. Tam latają piloci wojskowi, mają wykonywać rozkazy. Potem się >>opowiada bajki, że polski pilot poleci i wyląduje wszędzie, a wojsko konsekwentnie podtrzymuje ten mit. Fakt, ale nadal nie wiadomo jak to się naprawdę stało i pewnie się nie dowiemy. Pilot raczej pierwszakiem nie był, więc mógł lądować pod presją, szczególnie, że już wiadomo, że robił to trzy razy..... i za czwartym...... Pozatym pozostaje też kwestia lotniska, kompletnie nie przygotowane do tego typu warunków.... Wydaje mi się tez, że samolot jako taki nie ma tu nic do rzeczy, fakt konstrukcja stara, ale był po przeglądzie, więc ja stawiam na to, że ktoś mu wydał polecenie..... - o wszystkim, podczas rejsu, decydować powinien tylko pilot, niezależnie od tego kogo ma na pokładzie. Ciekawi mnie jak znajdujecie orędzie Miedwiediewa kontra kondolencje Obamy - cytującego jakąś starą, standardową regułkę (chyba jeszcze z czasów Wałęsy) mówiącą o jakimś polskim, mitycznym bohaterze narodowym, którym z pewnością był Poległy i jaki miał wkład w wyzwolenie uciskanego świata, jego znacznego przyczynku do upadku komunizmu (na równi z Papieżem) itp.? Nie jestem rusofilem, ale USA maja nas głęboko w d... i tylko wtedy sobie o nas przypominają, gdy szukaj frajerów, aby popchać przestarzały sprzęt, czy wysłać trochę mięsa armatniego, by krzewić demokracje, czyli zabezpieczać ropę. Znacznie lepiej wyjdziemy na zacieśnianiu partnerskich stosunków i rozwijaniu handlu w europie, także wschodniej. Znam osobiście kilku Rosjan z pracy i są to złoci ludzie, do których znacznie nam bliżej, niż do zimnokrwistych wasp-ów, którzy w najlepszym przypadku maja nas gdzieś. Mam nadzieje, ze ta tragedia zaowocuje zbliżeniem miedzy nami, a nie kolejnymi oskarżeniami i obrzucaniem medialnym błotem. Rosja, jest w głupiej sytuacji trochę teraz i należny to mądrze wykorzystać. Wiadomo,że to tylko słowa i nic to nie kosztuje ale w takiej chwili gesty też są ważne i potrzebne. Może przełoży się to na 'cieplejsze" postrzeganie Rosji przez nasz ostatnio mocno zindoktrynowany naród. Nawet powściągliwa Niemka Kanclerz Angela Merkel bardziej i z wiekszą troską pochyliła sie nad naszą narodowa tragedią niż strategiczny partner zza oceanu. "Znam osobiście kilku Rosjan z pracy i są to złoci ludzie, do których znacznie nam bliżej, niż do zimnokrwistych wasp-ów, którzy w najlepszym przypadku maja nas gdzieś. Mam nadzieje, ze ta tragedia zaowocuje zbliżeniem miedzy nami, a nie kolejnymi oskarżeniami i obrzucaniem medialnym błotem." Jestesmy z podobnej gliny i powinnismy byc sobie bliscy. Literatura, muzyka - Szostakowicz, Strawinski, Prokofiew, Rachmaninow, Czajkowski - to polowa mojej kolekcji plytowej. Historia powinna byc odklamana, a resentymenty odlozone. Zacznijmy sie nawzajem szanowac. Jesli takie wydarzenia jak to wczoraj maja nas czegos uczyc, cos zmieniac, to normalizacja wzajemnych stosunkow jest jednym z priortetow. Ciagle nie potrafie ogarnac i zrozumiec tego co sie wydarzylo. Potem powoli wszystko wróci do normy - "business is business"
Ja ciągle nie mogę przyjść do siebie. Żądam usunięcia Cenzury - poważnie. Jak to kto wydal rozkaz. Pilot wojskowy nie jest żadnym pierwszym po bogu w samolocie. Nawet ostatni nie jest. Jest jak kierowca TIRa, robi co mu każą. Ma działać na rozkaz i za wszelką cenę dążyć do wykonania zadania. Nie dowiemy się kto pilotowi kazał lądować mimo zaleceń obsługi lotniska odesłania do Mińska lub Moskwy. Bezpośrednią przyczyną z tego co wiadomo na dziś była mgła. Pilot szukał pasa lotniska lecąc na małej wysokości i z małą prędkością i przeciągnął samolot, zawadził o drzewo i nie był w stanie poderwać lub zawadził o drzewo zmienił kierunek i dlatego przeciągnął. W każdym razie kiedy chciał się poderwać po zawadzeniu o drzewo sytuacja była jeszcze gorsza. Za tą wersja przemawiają relacje dziennikarzy którzy lądowali w Smoleńsku mniejszym samolotem godzinę wcześniej. Mówili że ich pilot miał te same problemy. Po opuszczeniu podwozia obniżał i lot i podrywał maszynę kila razy szukając pasa lotniska. Z wiadomości wynika że prezydencki samolot próbował wylądować i rozbił się na lotnisku wojskowym Mnie zastanawia jeszcze dlaczego dopuszczono do sytuacji by samolot z Prezydentem RP na pokładzie lądował na wojskowym lotnisku gdzie psy dupami szczekają i dlaczego zapakowano do niego cały sztab wojska?? Wiadomo że transportowiec czy wojskowa maszyna wyląduje wszędzie bo musi. Ale samolot prezydencki nie musi lądować gdziekolwiek. Nawet jeśli to nieplanowany czarter można było lot zaplanować tak żeby zachować bezpieczeństwo i powagę urzędu. Ten cały plan lotu i próba lądowania wygląda jak zaplanowany przez wojskowych z typowym dla nich wyczuciem, był wolny kawałek pasa to tam zaplanowali lądować. Ten fotomontaż z postu nigi jest zupełnie od czapy. Rosjanom najmniej zależało żeby taka katastrofa odbyła się akurat na ich lotnisku. Dlatego właśnie Miedwiediew i Putin wykonują publiczne gesty. Dalej dywagowanie na temat szczerości i trwałości tych gestów świadczy tylko o braku dojrzałości i nie zorientowaniu w mechanizmach polityki międzynarodowej. avw, jedziesz samochodem, gps podpowiada Tobie "za 600 metrów skręć w prawo", po kolejnych 400m "za 200 m skręć w prawo", przed samym zakrętem: "skręć w prawo". To robi(w moim przypadku) gps za 200zł z marketu. Zdarza się owszem że cos poknoci np kiedy trasa jest remontowana i nie mam aktualnej mapy i to w zasadzie wszystko. Jak mówili, ze samolot miał być na wysokości 80m i w osi pasa a ciął drzewa na wysokości kilku m, lecąc do tego pasa pod kątem to chyba coś nie do końca teges. Elektronika w samolotach jak się spodziewam nie jest sporo słabsza od gps z marketu którym się posługuję...no chyba że rosyjska jest....albo wysiadła. Mylisz się kolego samolot jest eksterytorialna powierzchnia danego państwa i pilot jest na niej najwyższym zwierzchnikiem mimo przewożenia głowy tego państwa.On odpowiada przed państwem a nie przed prezydentem za to czym zarządza będąc poza jego terytorium. To regulują także przepisy międzynarodowe. Co do zaniedbanego lotniska opuszczonego lotniska to sami je na koszt naszej ambasady poszerzaliśmy, czyli lotnisko było przekazane niejako do naszych potrzeb od tych "złych ruskich". Putin i Miedwiediew nie wykonują pustych gestów, to nakazuje tradycja słowiańska i wynika to z naszej wspólnej kultury i korzeni. No ale my potrafimy dalej wszystko spieprzyć, nawet taka smutną ale okazję żeby nawiązać normalne stosunki-nie mówię o wieszaniu sobie na szyi bo do tego trzeba by było długich lat dobrych kontaktów sąsiedzkich które należy z OBU STRON wypracować. Daj spokój. Co ma wspólna tradycja i korzenie do najbardziej ostatecznego wydarzenia, jakim jest śmierć? Mimo wszystko protokol rosyjski jest nam duzo blizszy niz chociazby amerykanski w tym przypadku, zwlaszcza jesli idzie o kondolencje i zauwazanie naszego istnienia. >Mylisz się kolego samolot jest eksterytorialna powierzchnia danego państwa i pilot jest na niej najwyższym zwierzchnikiem mimo przewożenia głowy tego państwa.On odpowiada przed państwem a nie przed prezydentem za to czym zarządza będąc poza jego terytorium. To regulują także przepisy międzynarodowe. Rafael , chyba nie byłeś w wojsku. Wystarczy , ze ktorys szwej general- chcial " blysnac " przed prezydentem i odpowiednio " ZDOPINGOWAL " pilota. Widzisz czasem warto sobie odpuścić żeby nie przeholować; ja odpuszczam a Ty sobie to jeszcze na spokojnie przemyśl, masz rozum i wolna wolę podobno. Mam uwierzyć w szczerość gestów byłego siepacza KGB, który bez mrugnięcia okiem rozprawia się z przeciwnikami politycznymi (Litwinienko, Politkowska, Juszczenko, Chodorkowski itd.)? Gangsterowi, który jako zastępca mera Sankt Petersburga rozkradł zagraniczną pomoc dla miasta i pozwolił umrzeć z głodu tysiącom obywateli? Który na potrzeby kampanii jednej czy drugiej potrafi rozpętać wojnę z sąsiednim państwem? Musiałbym się z przysłowiowym chujem na głowę zamienić. Byłem w wojsku dwa bite lata i to za stanu wojennego i nie musisz mi mówić co i jak, pierwsza przepustka po 8 miesiącach a kolejne wyjście na zewnątrz czyli urlop po roku. Z wojska z drugiego roku służby pamiętam osobisty przypadek na poligonie w czasie ćwiczeń okręgu warszawskiego, kiedy zjebałem jako kapral obserwatora będącego w stopniu pułkownika. Ten złożył na mnie później raport w wyniku którego reakcja moich przełożonych była wręcz odwrotna do przez niego założonych. Dostałem ekstra 5 dni urlopu. Nie podejrzewam żeby pilot Tupolewa był tzw pizdą i słuchał cywilów; tym bardziej że w lotnictwie są mniej chore stosunki pomiędzy przełożonymi niż w innych formacjach.Raczej mogła zaszkodzić sprawa ambicjonalna typu: "co ja nie potrafię!" Pokaz mi Kratf jakiegos znaczacego polityka zagranicznego,w ktorego milosc do nas bys mogl uwierzyc bez mrugniecia okiem, ja takiego nie znam. W narzeczeństwie trzeba czasem poudawać i się dotrzeć nawet z przysłowiowym jak zauważyłeś "chujem"
ale co mam sobie "odpuścić"? twoje sugestie odnośnie mojego rozumu? Bez wzgledu na to , co ujawnią czarne skrzynki - zostanie ogloszone , ze to byl blad pilota . Oficjalny komunikat ujmie to ladniej : zawinil czynnik ludzki. W Smoleńsku są dwa lotniska z czego to wojskowe to jakąś betonowa nitka. Drugie jest cywilne i ma systemy wspomagania lądowania w warunkach niskiej widzialności. Kiedy pilot nie widzi pasa robi zygzaki i przechyla samolot. Leci z prędkością bliską przeciągnięcia gotowy do lądowania. Pas jest krótki więc dostrzeżenie go zbyt późno powoduje że musi się poderwać zawrócić i powtórzyć ten sam manewr na wyczucie celując w początek pasa. Jeśli warunki wokół lotniska zmuszają do wykonania krótkiego podejścia, samolot musi stromo opadać, tak jest na lotniskach wojskowych, wtedy nie ma czasu na szukanie początku pasa bo podejście jest zbyt krótkie. Nie wiem jakie systemy sygnalizacyjne tam były ale pilot podchodzący dużym samolotem cywilnym zbyt płasko ich nie zobaczy. Naprowadzenie samolotu to nie chiński GPS za 200 złotych a różnica odległość 2 km dla takiej maszyny to 10-15 sekund. Tyle mógł trwać upadek samolotu i dlatego jego szczątki znalazły się 2 km od lotniska. Pytanie nie brzmi dlaczego znalazł się 2 km od lotniska odchylony o 30' od osi pasa, bo to akurat łatwo wyjasnić. Pytanie powinno być: co pasazerski samolot robił nad lotniskiem wojskowym?? Wypowiadał się ekspert lotniczy na podstawie ułożenia szczątków maszyny, wywnioskował że przed planowanym przyziemieniem samolot był około 80 metrów za nisko. Pilot przeciągnął czyli stracił nośność na skutek zbyt niskiej prędkości, przypadkowo albo wydawało mu się że widzi pas i rozpoczał ladowanie za wczesnie albo dlatego że zawadził o drzewo lecąc zbyt nisko i samolot odchyliło (skrzydło daje siłę nośną tylko pod odpowiednim kątem, samolot nie jest w stanie lecieć bokiem więc kiedy zostanie wytrącony z kierunku lotu to traci silę nośną i spada). Pilot zwiększył ciąg silników ale jeśli samolot się odchylił od kierunku lotu i miał za mała prędkość, nie był już w stanie go poderwać i kolejne 10-15 sekund oddalał się od pasa lotniska. Co ma eksterytorialność samolotu do tego, że pilot wojskowy nie jest od myślenia i decydowania tylko od wykonywania rozkazów?? Od myślenia byli jego dowódcy zanim wysłali samolot pasażerski z prezydentem na pokładzie i sztabem sił zbrojnych na zabite dechami lotnisko wojskowe zasłonięte mgłą. Pilot dostał rozkaz wylądować więc lądował mimo że obsługa lotniska proponowała zmianę miejsca lądowania. Przy okazji, wspominano ze tydzień wcześniej lądował na tym samym lotnisku Premier. Jednak Premier poleciał Jakiem-40 samolotem znacznie mniejszym i przystosowanym konstrukcyjnie do lądowania na krótkich pasach polowych. Cała ekipa towarzysząca Premierowi poleciała transportowym Cassa, który też jest w stanie wylądować na lotnisku wojskowym. I pogoda wtedy była dobra. Prezydencki TU-154 jest samolotem pasażerskim i na odpowiednim dla niego lotnisku powinien lądować. Wiec co robił nad lotniskiem wojskowym?? Kto mu zaplanował całą trasę lotu, kto nie przewidział zapewnienia lotniska awaryjnego. Wreszcie, kto wsadził na pokład jednego samolotu dowódców wszystkich sił zbrojnych? Powtarza się sytuacja z wypadku wojskowego transportowca Cassa. Wojskowa bezmyślność aż bije po oczach. w jednym poście piszesz o wypracowywaniu jakichś "normalnych stosunków", a w drugim o "nie podskakiwaniu wyżej dupy"